Walk into Cam-Tech Manufacturing’s Mansfield, Texas, operation and you can’t ignore that the company is poised for growth. The visitors’ entrance leads to a mezzanine overlooking the manufacturing floor. Directly in front sits a new Makino T1 5-axis horizontal machining center. “Sits” is perhaps not the best word to describe a mill that cuts commercial and military aircraft parts from titanium at 12,000 rpm and 32 inches per minute throughout two 10-hour shifts, including Saturdays. Cam-Tech’s management strategically located the impressive T1 to ensure it was the first thing seen upon entering the 80,000-square-foot facility—and for good reason. Precision machining of large structural airframe components is central to the company’s strategy to compete for work globally. 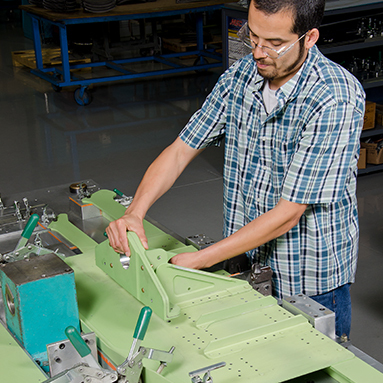 Not only did the company invest in advanced T1 technology, but they also designed an expansive, state-of-the-art assembly area to support rapid growth as a premier fabricator of wing and fuselage components. 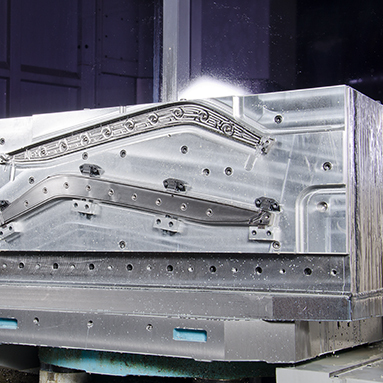 After working with SST and Makino engineers to improve tooling, work holding and programming, Cam-Tech reduced cycle times by 50 percent. As a supplier to major OEMs and Tier 1 integrators, Cam-Tech caught the eye of Newington, Conn.-based PCX Aerostructures LLC, a global leader in highly engineered, precision machining of complex parts from both aluminum and hard alloys. PCX ultimately acquired Cam-Tech in December 2014, increasing their breadth of services in the aerospace manufacturing arena. It was a perfect fit. Makino and SST worked closely with Cam-Tech’s programmers to explain how they can maximize the capabilities of their T1 investment with faster cycle times and improved quality. The rigidity and cutting capability of the T1 has enabled Cam-Tech to reduce part cycle times by as much as 50 percent in complex materials and applications. With the T1’s laser-equipped tool setter, Cam-Tech is able to check tool length and automatically replaces worn tools to ensure the highest level of accuracy and finish. Cam-Tech’s ability to machine parts and complete full assemblies in-house provides an advantage to its OEM and Tier 1 customer base. Purchased initially for precision machining of titanium, the T1 is now used for about 40 percent of the parts Cam-Tech manufactures. The T1 was purchased to produce 28 part varieties, supporting production of three aircraft a month. PCX funded the T1 following its purchase of Cam-Tech, another signal to help convince industry OEMs and Tier 1 suppliers that the combined company is investing to expand its capabilities and to grow with them. The return on the T1 investment makes Cam-Tech very competitive. Ribs for a Boeing application initially were produced 40 percent faster compared to the company’s existing commodity machines. The company worked with engineers from both Makino and Single Source Technologies (SST) to improve tooling, work holding and programming. Ultimately Cam-Tech was able to reduce cycle times by 50 percent. “PCX looks for a return on our investment in 24 to 36 months. With the programs we’re running on the T1 and how well they’re running, we’re certainly going to realize a payback on the short side of that period,” Hartman said. 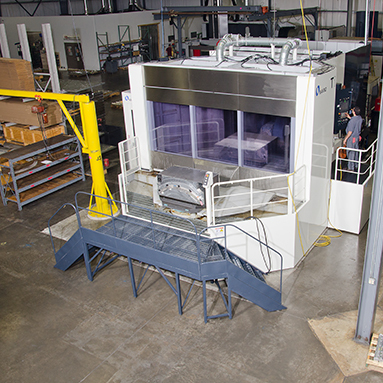 The company purchased this 5-axis machining center to produce 28 part varieties, supporting production of three aircraft a month. The OEM has since raised its manufacturing rate to four aircraft a month. “We were already exceeding our original expectations based on the time studies provided by SST, and now we have the capacity for an additional 25 percent. With the assistance of the Makino applications engineers, we’re able to go to an unattended situation to keep the machine continuously running,” stated Cam-Tech General Manager Roger Hagger. About two years ago, Cam-Tech’s leaders decided that the way to remain competitive as a supplier of critical structural parts for large commercial aircraft and military contracts was to become a subassembly provider. Parts such as center wing-box frames, blocker doors, leading-edge ribs, bulkheads and fittings would be produced and assembled at Cam-Tech and ultimately shipped to OEM and Tier 1 integration centers. Cam-Tech subsequently built a 65,000-square-foot building in 2011 and added another 15,000 square feet in 2015 to make room for additional machines and structural assemblies. The employee base grew by 30 percent. 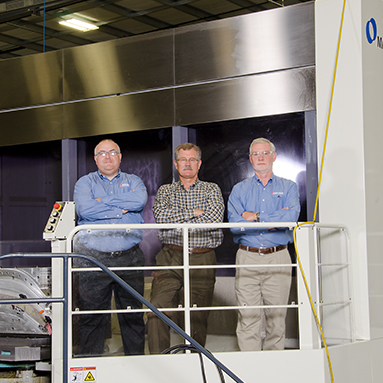 Now operating as a wholly owned subsidiary of PCX Aerostructures, the company invested in Makino’s T1 5-axis machining center, the most advanced equipment they owned that was capable of machining titanium—a hard alloy used in approximately 40 percent of the company’s parts. “PCX brings financial and technological resources for Cam-Tech to become a go-to shop for the aerospace industry for their complex assemblies that other shops have not been able to succeed in. A lot of the parts we have bounced around the world and ended up landing here and stay here because we’ve got the know-how to get it done. With the right vendor base and the right machine capabilities now, that will continue to happen,” Hagger said. Now operating as a wholly owned subsidiary of PCX Aerospace, the company invested in the T1, used for about 40 percent of the parts Cam-Tech manufactures. Cam-Tech’s leaders teamed up with SST and Makino to leverage the unique features of the T1 to win a Boeing contract for a military jet-door stiffener rib. Hagger visited engineers at Makino’s North American headquarters in Mason, Ohio, and traveled to Makino’s factory in Japan with Steve Neidigk, the company’s local SST representative. 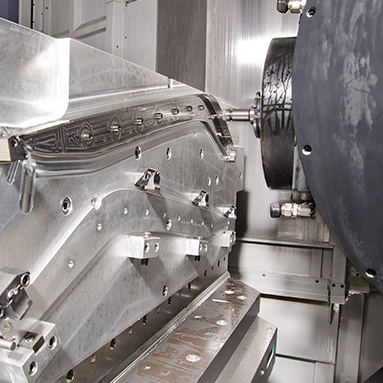 SST prepared accurate time studies that demonstrated Cam-Tech could produce parts faster and with better quality on one T1 machine versus two of its existing machines. 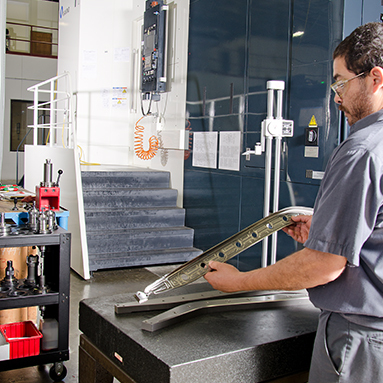 SST and Makino offered engineering application support and on-site training far beyond anything Cam-Tech’s team had received from previous machining center providers. In addition to a week of on-site training included as part of the T1 investment, Cam-Tech opted to purchase an additional two weeks of support, enlisting the expertise of both SST and Makino engineers. Together they assisted shop employees with the initial setup process, fixture implementation and programming adjustments. The T1 mills large aircraft structural components with ease, some starting out as titanium billet weighing up to 2,500 pounds. The T1 hogs out as much as 1,600 cubic inches per minute on structural parts for military jets, including one that Cam-Tech had originally produced on one of its commodity machines. “It took 12 hours to cut the part on existing equipment. On the T1, it takes six hours,” Hagger said. 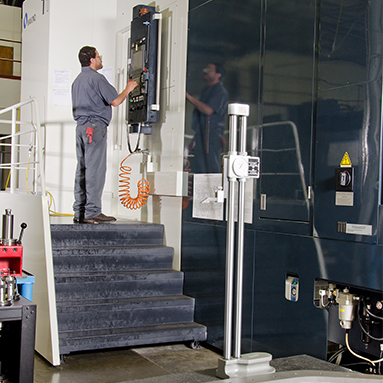 Based on the proven speed and efficiency of the T1, Cam-Tech began transferring numerous jobs over from other machines. Operators didn’t change existing programming, but simply moved them from an existing machine onto the T1. 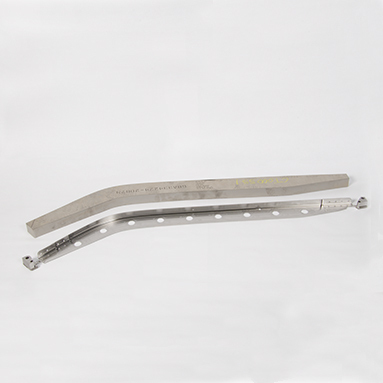 As a result, Cam-Tech reduced the cycle time for a complex, thin titanium fuselage component by half, while holding tolerances of plus or minus 0.00014 inch and positional hole tolerances of plus or minus 0.0010 inch. The accuracies evidenced by the T1 also helped Cam-Tech save on inspection costs by requiring only sample testing. The same parts historically produced on the company’s existing machines all require inspection because the mills cannot hold the required tolerances with consistency. The T1’s laser-equipped tool setter checks tool length and automatically replaces worn cutters and end mills before affecting tolerances and surface finishes. Currently 35 tools are stocked in a 120-tool magazine, with multiple backups for high-usage cutters and finishing tools. “We have other machines that cut titanium, but the T1 is becoming our go-to machine because it’s reliable and accurate, and it’s so much faster than anything in our shop now,” Hagger said. What matters most to Cam-Tech’s leaders is growing their business into a build-to-print shop, manufacturing and assembling large structural components for commercial and military applications. To accomplish that, they’re investing in advanced machining technology—and people. Hagger has made it his mission to reshore work lost to Southeast Asia, because he believes American workers can make aircraft parts competitively with the right equipment and training. The company started in 2000 with 16 workers and six machines in 15,000 square feet. They have now grown to more than 60 employees, 21 machines and 80,000 square feet. Cam-Tech’s goal is to build another 40,000 square feet to add assembly capability, more machining centers and another 40 employees. The addition is designed to house component subassembly for projects now in development for business-class jets from Embraer and Gulfstream. This expected growth relies on the performance of the existing T1 and the addition of two Makino MAG3.H 5-axis horizontal machining centers. Built for high-productivity machining of complex aluminum parts, the MAG machines are going to share a linear pallet pool system—as Cam-Tech adds automation for the first time. “We’ve designed the expansion of our facility in Texas to accommodate large aerospace subassemblies. We’re trying to stay ahead of the needs of our customers with capability that they’re hopefully going to help us fill up,” said Hartman.